It had never been my intention to do an Ironman in September in 2017 as I had wanted the late summer off. 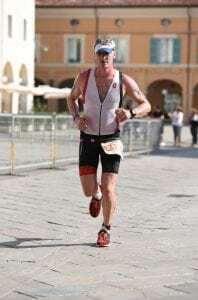 However the Lanzarote experience (food poisoning) had forced me to seek another one out and as it was the first event in Italy, and the food is so good, Karen was keen to get me to sign up. So we arrived a few days before and settled into the hotel and the great atmosphere these events generate. Despite my gastronomic disaster last time I still played shellfish roulette at dinner. It wasn’t much of a risk as you could toss the shells and hit the fish market behind if you wanted. The day of the race was perfect. Smooth warm water and a gentle breeze. I had sought out my first ever swim lesson 2 weeks before and this paid dividends as I was 3 minutes faster than my PB. So I was up for it, the target was a sub 10:30hr race, previous PB was 10:53. However the transition was over a kilometre long and the bike was 5k longer than usual so that was a big ask. Still nothing ventured nothing gained. 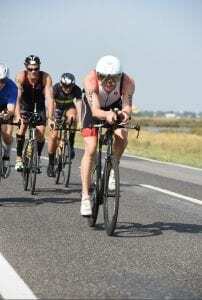 As I had exited the swim fairly quickly I found myself in a fast group of riders who initially worked together within the rules (no draughting) and the pace was high. However some soon started to realise that two brits, me and a chap called Duncan were pushing on and they started to draught. In fact there was a lot of draughting. This is very annoying as it wears you out but rests the opposition. So I had to pace myself to not be spent when the marathon started. To make matters worse the top of my water container popped off and I was getting covered in sticky drink which should have been going into my stomach! Any small loss of hydration can have serious effects on performance. It also makes it hard to eat your food. This cost me time and I lost the quick group. By the time I finished the bike I felt as if I had made up the deficit and my legs felt good as I ran up T2 with the bike. A quick change and I was off on the run with an expected finish time of sub 10 hours. I was feeling great and stoked by the time. Karen was cheering me on fervently and we were in for a good one. That is the biggest mistake Ironman Triathletes make. They get carried away and run off too fast. First 10k, flying along (for me) at 8 min miles, next 10k just a little slower then BOOM my quads went tight and I was struggling to run. Stretching nearly gave me cramp so I gave that a miss and it was shuffle, jog, walk, curse, question my sanity at doing something so crazy such as entering and then being stupid to not run enough in training. It’s tough being in the mind of an exhausted person when you still have a half marathon to race. You want to stop and give up. You want to swap places with the person being pushed around the course in a buggy. Wait a minute. Did I just see that or am I about to collapse? No I was not hallucinating. There really was a team who had swum with a less abled chap in a rubber dinghy for 3.8k, then towed him on a bike for 185k and now there they were, on the run smiling. Yep, smiling. I couldn’t give up now, so it was gels and flat cola by the bucket load, plenty of thigh slapping, swearing and gradually my legs returned. With a huge effort I started to run continuously and pick up the pace again. I was hopeful that my target of 10:30 was still on but as I got to the final 5k I realised that was long gone. The next target was a PB of sub 10:53 and I managed to get to the line (which you feel may never come) in 10:42. Respectable, but could have been a lot better if I had paced my run. The run came in at 4:05 which was only 4 minutes slower than last year when I ran all of it. So I really had been the hare when I should’ve been the tortoise. I am not doing a big one next year as life is likely to get a little too busy, but I can manage a couple of middle distance Tri’s and may have a pop at Time Trialling on the bike.